January 9, 2017 January 9, 2017 by Beau H.
So, if you’ve checked your calendar — or the weather forecast as of late — you might have realized we’re likely getting closer to what some might call the dreaded “polar vortex.” I’m no meteorologist, but we’ve been through some pretty chilly cycles already — and January is a prime month for huge snowstorms slamming the country. With that in mind, we’re tackling a functional men’s style suggestion — a past entry in this site’s #OOTD series covered how to dress for the first snowfall, but a polar vortex or blizzard is a different beast entirely. It’s different than casually layering up for winter or dressing for a weekend coffee date, that’s for sure. For one, it’s colder, windier and sometimes, just plain uncomfortable to navitage. That’s why the gear below is harder-wearing, tougher and not quite office-friendly if you need to suit up frequently. But, what guy can’t use a durable parka or rugged winter accessories? Exactly. So prep to take on winter right this very second with the latest Style Guide suggestion — and weigh in over on Facecbook if you’ve got other #menswear situations you’d like to see covered. Unique, functional and modern in design — just what you want from a parka. Outerknown is a bit of, well, an outlier in its approach to blending technical specs with modern takes on classic silhouettes — yes, it’s a pretty advanced approach. Pieces like the Nomadic Parka embody that blend perfectly — the mobile, ergonomic design and cool, not overly bulky M-65 silhouette are big bonuses compared to typically puffy parkas. The Indigo color of the Nomadic Parka is sharp, simple and versatile — plus, the jacket’s silhouette provides ample layering room. A cozy base layer that’s a bit dressier than a plain thermal shirt. We’ll start with a warm, reliable and stylish base layer in the Flint and Tinder Texas Moleskin Shirt. Granted, it’s not a cozy thermal by any means, but we’re going for a mix of form and function here — so, moleskin it is. The fit on this shirt is modern and crisp, and it’s got the same quality construction one would expect from the makers of pieces like the Flannel-Lined Waxed Trucker Jacket and a heck of a pair of blue selvedge denim. This is a shirt that works for weekends or casual workdays alike. A slim, crisp sweater that’s really two for the price of one. Told you we’d be layering up, right? Again, Flint and Tinder is the easy pick here for a standout blend of quality, style and affordability. The Reversible French Terry Sweatshirt is all of those things, and then some. In fact, you’re getting two sweatshirts for the price of one, really — one side is a classic sweatshirt design, and the other side is a textured loopback fabric for a look that’s a bit more casual. Either way, the crewneck collar and raglan sleeves frame your face and shoulders while layering nicely under the indigo parka. That’s a win-win … win. Slim-straight denim with a brushed-back interior for comfort and warmth. Who said you had to throw on bulky snow pants to combat a blizzard? Certainly, if you’re stepping through feet of snow, you might want to reach for something a bit more weather-ready — but slim denim can work in a pinch. In fact, this pair of Abercrcombie & Fitch winter denim is quite unique — the interior of this pair of jeans is constructed of soft, brushed-back fabric for added comfort and a surprising amount of mobility (Santa brought me a pair for Christmas, as it were). Plus, the slim-straight cut slides over your winter boots with ease. A tough Goodyear welt and moc toe, plus a lugged rubber outsole — as good as it gets. OK, so this is perhaps the most crucial part when it comes to tackling a winter blizzard — right? These Woolrich Footwear Squatch Boots are the definition of toughness and durability, and they don’t look half-bad either. The Goodyear welt and comfort sock liner are big positives in terms of construction, and the durable moc toe and lugged rubber outsole are also critical when it comes to stepping through the snow. Plus, to snag the Squatch Boots — which really can do just about anything in terms of winter adventures — for under $150 is a heck of a deal. Well-made, comfortable and warm winter socks. Next up in keeping you warm and comfortable during a snowstorm? A great pair of socks, of course. And the Merino Lite Hiker Socks are just what the doctor ordered — starting with the merino wool and nylon blend and carrying through to extra-helpful design touches like the no-stretch and no-itch capabilities. Plus, the navy colorway is clean and simple and you’re getting a nice price for American-made construction. Handsome, essential and warm winter accessories — crucial, right? Just as crucial as a thick pair of socks? A great pair of tough winter gloves and a stylish and warm winter cap. 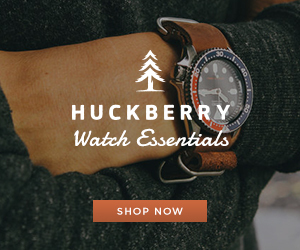 So, that’s what the good folks at Huckberry are giving us today. Hestra’s gloves are premium, well-made and yes … quite pricey. But, their gloves are still made in their own factories, and in this case, the blend of vegetable-tanned elk leather and wool terry lining is just about everything you need in terms of form and function (that phrase keeps coming up ‘cuz it’s so darn important!). And there’s nothing overly fancy or expensive about the Columbiaknit Watch Cap — it’s the right color and quality to keep you warm this winter. A handsome-as-heck watch and a tough belt — the best you can do during a blizzard. If you think we forgot about tough, essential finishing touches for this cold weather-ready look, you’re mistaken. Because we’re dealing with cold, chilly and blustery weather, you need a watch that can take a beating. The Huckberry Lum-Tec Combat B33 GMT is that very watch, featuring a hard-wearing but not overly large 43mm stainless steel case, gunmetal titanium coating and Super Luminova materials on the dial for maximum visibility. So yeah, it’s up to the challenge. And when you need to navigate slippery terrain in comfort, a stretch belt made with comfort-fit elastic is the one way to go — so the Arcade Belt Co. Guide Belt is a reliable, easy-to-wear and durable choice. Are you ready for that blizzard yet? In looks if not mentally, I hope this piece is useful to you — and if you find you need to stock up quickly, you best start shopping away! When you build your ensemble around comfortable, easy-to-layer pieces like the Flint and Tinder Texas Moleskin Shirt and top that base layer off with a reliable, easy-to-wear and American-made crewneck sweatshirt, you’re going to be primed for comfort and style. Plus, a sturdy winter parka is as dependable a piece of winter outerwear as it gets — and durable moc toe boots are yet another item that’s going to get you through that polar vortex. Of course, you shouldn’t skimp on a versatile field watch like the Lum-Tec Combat B33 GMT — no matter the weather. OK, ready for winter now? Maybe a bit more? Good luck out there, stay warm and look for a new #OOTD post tomorrow. January 3, 2017 December 23, 2016 by Beau H.
Perhaps like your Style Guide author, you’re starting to get into the swing of things when it comes to revamping your style this year. New Year’s resolutions, particularly men’s style resolutions, can be tough to start and even tougher to keep — but if one of your resolutions involves working more classic pieces into your wardrobe, the first #OOTD of 2017 should help you do just that. It’s all about picking a classic piece — the Oxford shirt — and finding a winter weather-friendly way to wear it (if you’re in a warmer climate, you can certainly keep this look while ditching a few layers). Now, we talked about how to wear an Oxford last winter, but this particular look refreshes things a bit. In this case, that involves taking some rugged pieces (like the Taylor Stitch Rover Jacket) and pairing them up with tried-and-true, essential layers (like a henley sweater that you might recognize from my winter trip to Baltimore). And although you might not see ’em in the below grid, remember to layer up with stylish winter accessories. OK, ready to get started with how to wear an Oxford this winter? Of course you are. Let’s connect on Twitter to talk more menswear, and I hope you enjoy this week’s #OOTD! Starting with a classic Oxford and adding a tough jacket, warm layers and classic accessories. The Jacket: Taylor Stitch Rover Jacket, $298 — So, as mentioned earlier, here’s the starting layer — the tough, durable, handsome and versatile Rover Jacket from Taylor Stitch. Yes, it’s all of those things at once. Lined in moleskin, it features a tightly spun cotton canvas exterior for warmth and functionality on cold days. The Shirt: Abercrombie & Fitch Oxford Shirt, $28.80 — Consider this another “new classic” from the majorly revamped Abercrombie & Fitch brand. It’s modern, it’s versatile and it’s very affordable — plus, the “Mint” color is a nice change of pace and really leans more blue than green. The Chinos: J. Crew Factory Driggs Broken-in Chino, $29.50 — When it comes to affordable staples that get the job done, the Driggs Chino — in slim fit, no less — performs well in winter… and spring… and summer, come to think of it. The Boots: G.H. 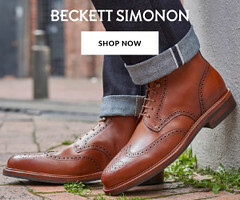 Bass Buxton Boots, $425 — While people tend to think of Bass for its classic leather loafers, the brand also makes one heck of a pair of USA-produced boots. These are handsome and remarkably tough, preppy yet rugged. The Belt: J. Crew Factory Washed Leather Belt, $19.50 — Just as with the Driggs Chinos above, J. Crew Factory gets it right when it comes to versatile, affordable accessories — particularly this casual washed leather belt. The Socks: American Trench Fair Isle Sock in Merino & Cashmere, $28.98 — Is it worth it to spend nearly $30 on socks? When they’re made in America by the great purveyors at American Trench, then the answer is YES. The Watch: Jack Mason Racing Chronograph, $305 — When you mix in so many heavy textures — like the henley sweater and the tough Taylor Stitch Rover Jacket — you can counter that with a rather sleek, fast and sporty watch like this Jack Mason timepiece. When it comes to a timeless piece like the Oxford, the best thing you can do is shake things up — sometimes. Of course, the shirt will always have its place in classic business casual offerings — and this outfit could work in much the same way — but adding rugged outerwear piece like the Rover Jacket mixes things up. Plus, if the new Abercrombie & Fitch keeps churning out stellar pieces, you’ll want to wear that wool-blend henley sweater as often as possible. And complementing classic and rugged pieces with slim chinos and tough-as-heck G.H. Bass boots is a foolproof way to look great no matter the weather — yes, even when dressing for the polar vortex. If you have any suggestions for how to finish off this #OOTD , let me know in the comments below. Stay warm, stay stylish and thanks for kicking off the new year in style!